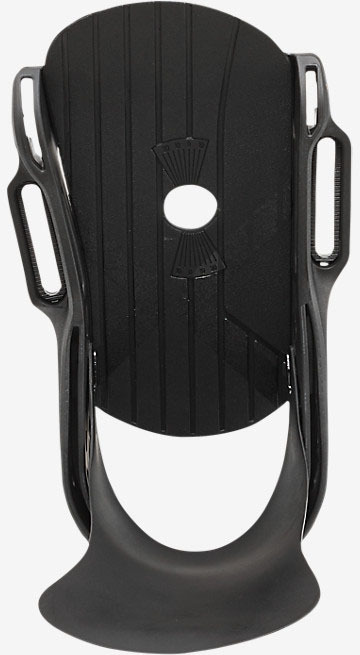 The Burton X-Base EST Snowboard Binding is pretty much a lighter Diode EST without the hinge tech. To us it wasn’t really worth the money but to those looking for a super light super high end Burton only binding it might work. Flex: Stiff and very snappy. Seems snappier than the Diode. Adjustability: Same great adjustability as all EST bindings. 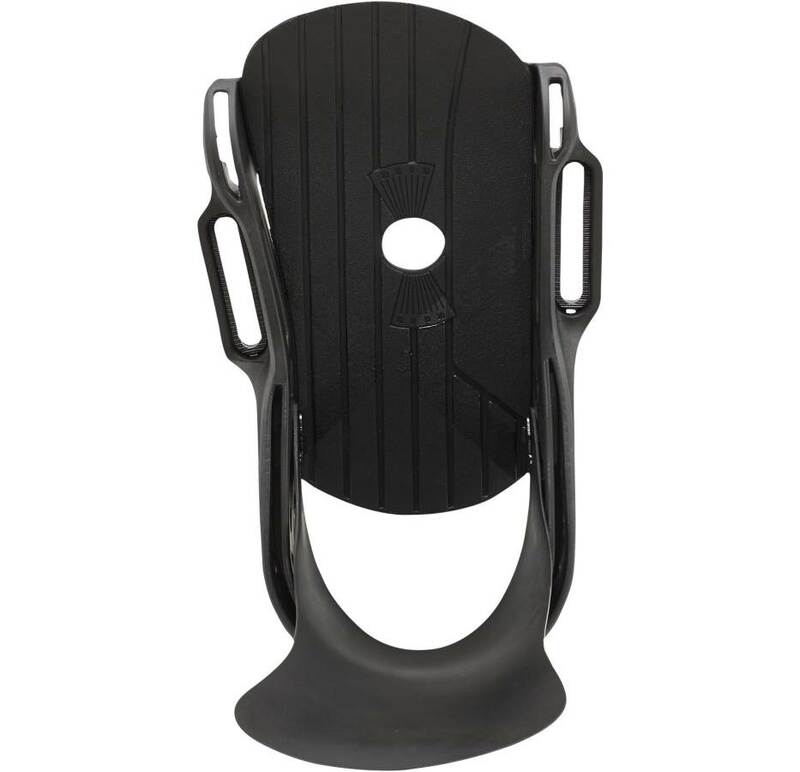 One of the best when it comes to high back rotation and placing the binding where you want it on the board. 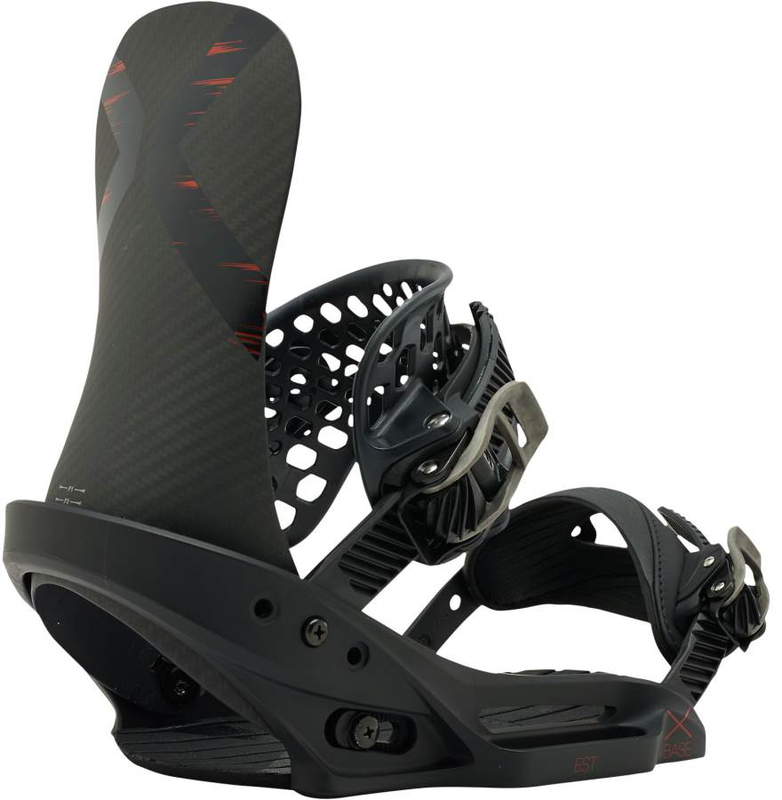 Not as good as some bindings when customizing the footbed to your boot but still pretty good. Comfort: Very comfortable and it fit easy around our boots. Turn Initiation: Smoother than you would think for how stiff and snappy it is. It’s not quite as responsive as other stiff flagship bindings we have come across but it turns a board pretty quick. 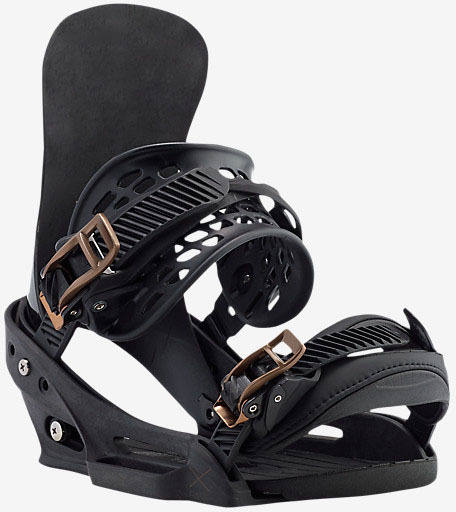 Buttering: EST bindings are all about butterability and they make a board flex easier underfoot than almost any other binding we encountered. They only work with Burton boards which is a huge disappointment but if you only have burton boards then they will butter very well underfoot. If you can’t butter with these bindings then your board won’t butter with any. 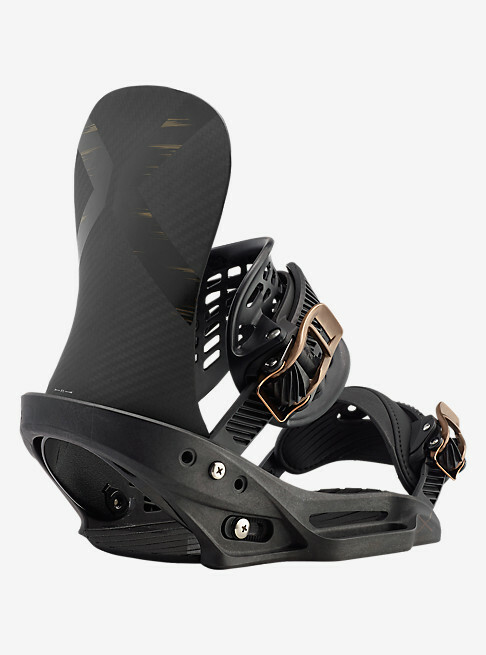 Boot Support: Wraps around your boot very well and maybe other than high end bindings like Flux there isn’t a more supportive boot. Well at least with what we tried. Ratchet System: Smooth easy and the best in the business. Not much bad to say about these and after 2 years of owning these double sided ratchets now we have had no problem. 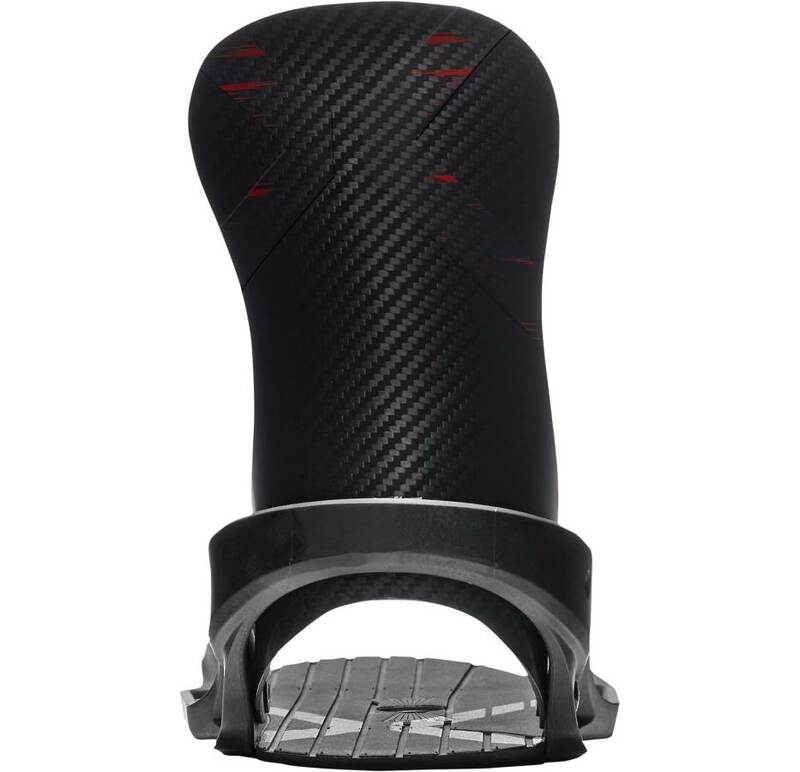 Shock Absorption: Almost nothing there so you are really relying on your boots. I think you might be able to upgrade to a thicker pad but not 100% sure. 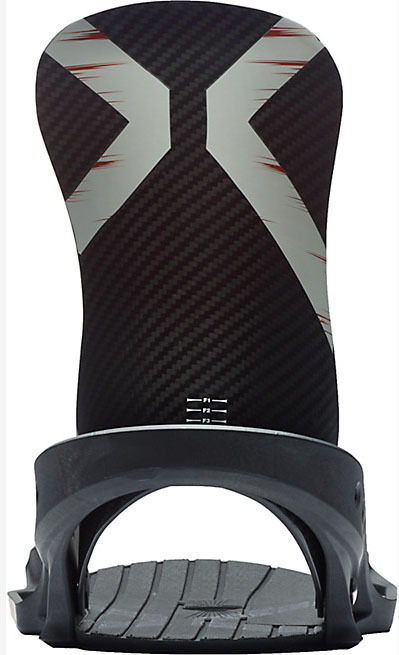 With the Burton X-Base EST it’s more about feel underfoot and a direct relationship with the board. That comes at a price which is not only in the wallet but possibly your joints too from the extra shock you will have to absorb yourself. So all in all this is a very very expensive binding that only works with Burton boards so to us this is not worth the money. Also they eliminated their pretty well liked hinge tech to save weight so you loose a little ollie power compared to the Burton Diode EST. 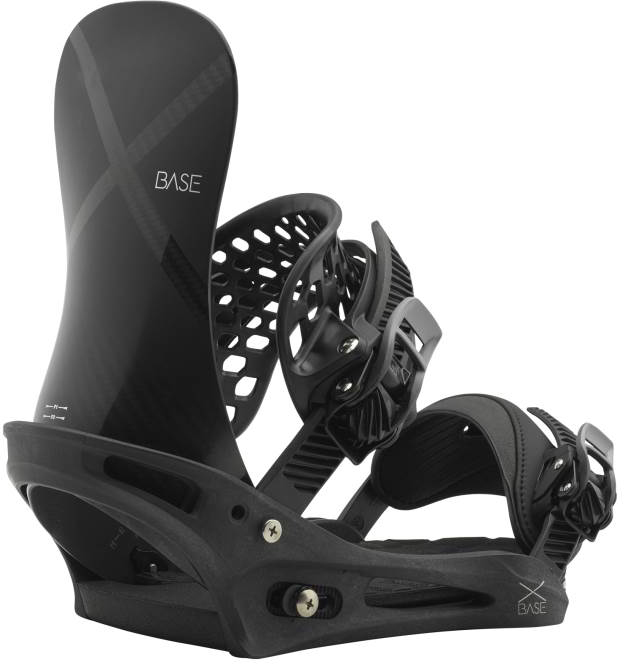 We try to get as many images of the Burton X-Base EST, but forgive us if they're not all there. So I had Burton Diodes EST 2014-2015 and switched to X Base EST. I thought it would be an upgrade but it wasnt. 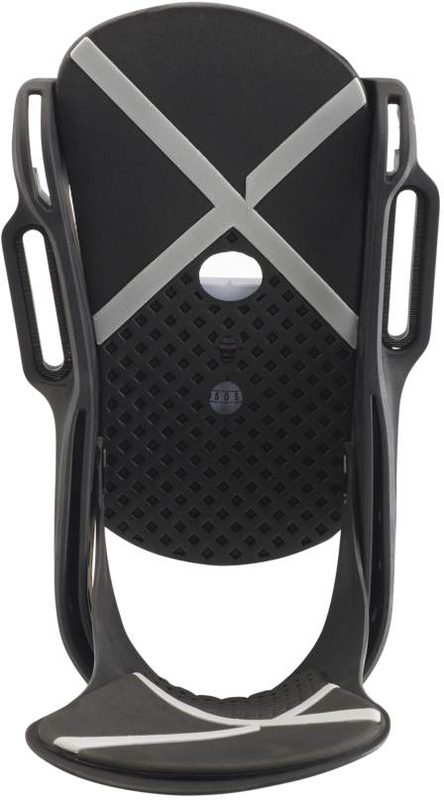 First thing about X Base EST bindings - EST Bed is twice thinner than in Diodes (around 5-6mm) so there is no shock absorption and this is really bad because 1) you can feel every bump and vibration of the board and it is very uncomfortable, 2) it is bad for your legs and back. Second thing - you cant set up your exact angles because there is no indication like on Diodes, only some lines with numbers that shows very approximate angles. Happily Burton switched the EST Bed in 2018 model, it is still very thin but now shows exact angles. 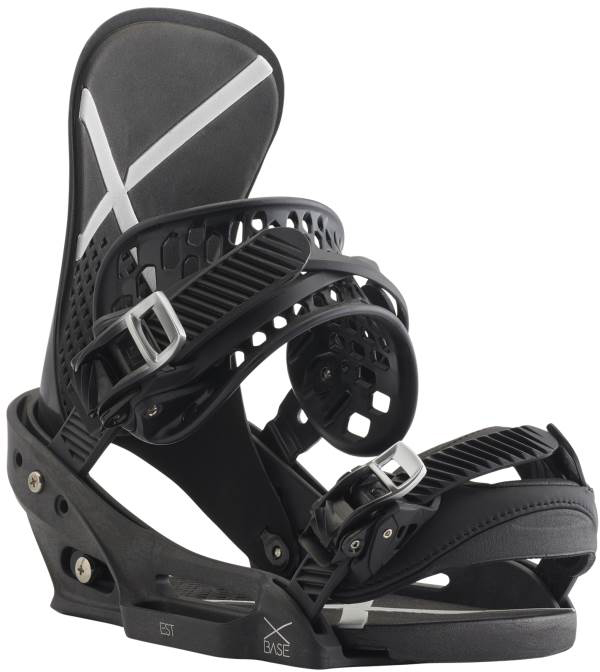 Third thing - there is no easy forward lean adjustment, which every other Burton binding has. I dont really use it, but come on, Burton. Forth thing - there is no Hinge tech which Diodes have. 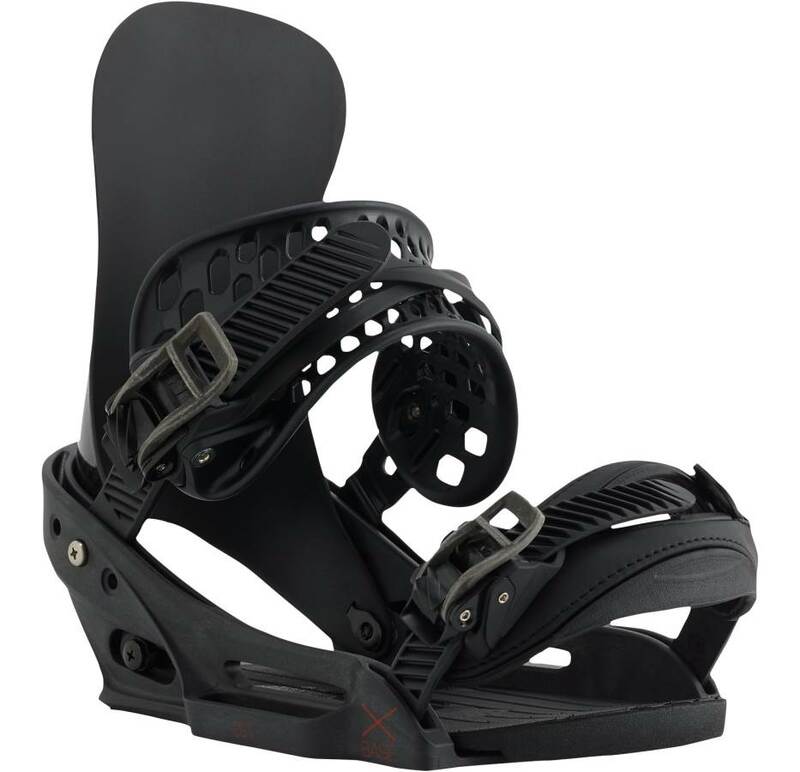 I didnt notice a lot of advantages with Hinge tech, but X Base is the most expensive binding Burton has and I dont understand why I dont have all the high end tech for that money. But there are some good things about X Base EST aswell. Comparing to Diodes they are much stiffer and toughter, on my personal scoring I would say Diodes are 7 out of 10 and X Base is 9 out of 10 on stiffness. They are very stiff. 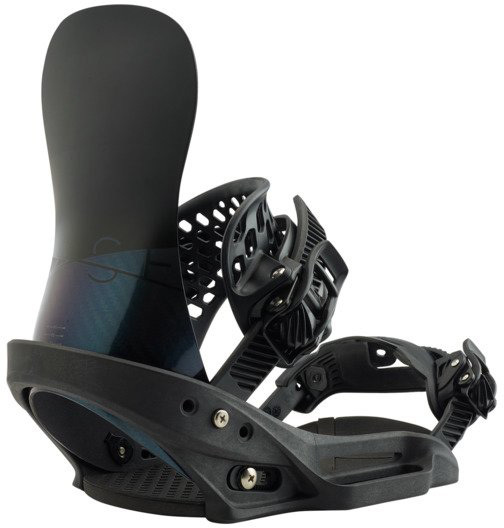 If you but this bindings I recommend you buy another EST Bed from Diodes or any other Burton bindings and you will greatly increase shock absorption and would be able to set up your angles. Also X Base feel lighter than Diodes, not much, I would say like 50 grams lighter and you probably wont feel it. 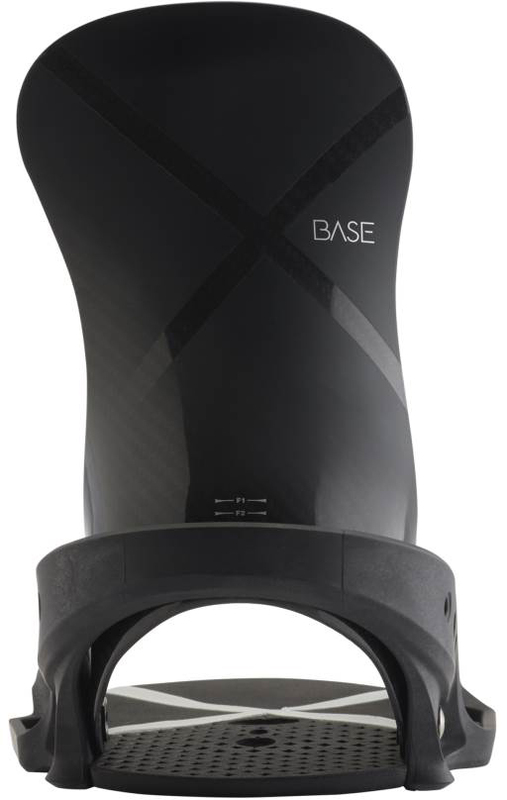 And what attracted me most X Base is made from carbon and look awesome, much more cooler than Diodes and any other binding.